We’d love your help. Let us know what’s wrong with this preview of More Is More by Blake Morgan. "Less is more" may be good advice for many efforts, but it is terrible advice when it comes to customer experience. Brands that want to stay relevant must apply more energy, focus, and resources to creating knock-your-socks-off customer experiences than they ever did before. Companies that embrace a "more is more" philosophy work harder and go further to ensure that their "Less is more" may be good advice for many efforts, but it is terrible advice when it comes to customer experience. Brands that want to stay relevant must apply more energy, focus, and resources to creating knock-your-socks-off customer experiences than they ever did before. Companies that embrace a "more is more" philosophy work harder and go further to ensure that their customers have a positive experience: they do this through customer-focused strategies and leadership, via operations, policies, and procedures that consider how the customer will fare in every scenario. To ask other readers questions about More Is More, please sign up. If you are a Customer Experience practitioner than you need to read this book! Blake puts things in simple terms (at least to me) on how to Care about the experiences you have with your customers'. I liked how Blake broke down the different styles of the generations, her specific examples on how some companies are treating their CX and at the end of each chapter a quick round-up of the top items covered in that chapter. I highly recommend reading this book and gaining the insights that you can ap If you are a Customer Experience practitioner than you need to read this book! Blake puts things in simple terms (at least to me) on how to Care about the experiences you have with your customers'. I liked how Blake broke down the different styles of the generations, her specific examples on how some companies are treating their CX and at the end of each chapter a quick round-up of the top items covered in that chapter. I highly recommend reading this book and gaining the insights that you can apply to your company to delight your customers and gain new ones. 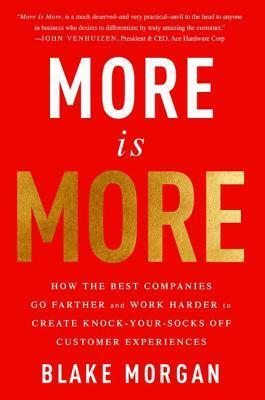 In More Is More: How the Best Companies Go Farther and Work Harder to Create Knock-Your-Socks-Off Customer Experiences by Blake Morgan. The recent economy is littered with the bones of the older companies who have not changed with the times. In the modern digital environment is difficult to compete, many corporate heats are focusing on better advertising, or even ignoring the endearing process, claiming it is “better sold than good”, fixating on quarterly reviews and immediate benefit. The author In More Is More: How the Best Companies Go Farther and Work Harder to Create Knock-Your-Socks-Off Customer Experiences by Blake Morgan. The recent economy is littered with the bones of the older companies who have not changed with the times. In the modern digital environment is difficult to compete, many corporate heats are focusing on better advertising, or even ignoring the endearing process, claiming it is “better sold than good”, fixating on quarterly reviews and immediate benefit. The author points out that many executives and small-business are ignoring one of the best sources of business is from the potential of getting repeat customers, rather than corralling new ones. This can be done by having a good product, which many companies do, but also by being focused on the customer. Which it turns out is not just a polite smile, but a whole infrastructure. The easier it is for a customer to do business with a company, the harder the company has had to work to make it that easy. The goal is clear: the customer needs to have their needs met consistently, reliably, and systematically. Just like you would with accounting. This is where technology comes in, the places where customers make contact with a branch are now relationship-building tools rather than just a pit where money is to be tossed so customers will give us their money. It’s interesting to see how things are starting to go full circle. When businesses were industrialized there was profit in keeping the customer at a distance with mail-order catalogues and selling on paper. Now that things are digital? It’s almost like people are returning to the old idea of interpersonal business, only on a massive scale given digitization. In More Is More: How the Best Companies Go Farther and Work Harder to Create Knock-Your-Socks-Off Customer Experiences by Blake Morgan, Morgan lays out an organizational psychology theory on how companies can gain and retain customers by creating exceptional customer experiences from initial advertising to customers becoming repeat customers of a brand. The typical company is not currently using advertising to their best advantage to inspire a customer to purchase their product. Further, the com In More Is More: How the Best Companies Go Farther and Work Harder to Create Knock-Your-Socks-Off Customer Experiences by Blake Morgan, Morgan lays out an organizational psychology theory on how companies can gain and retain customers by creating exceptional customer experiences from initial advertising to customers becoming repeat customers of a brand. The typical company is not currently using advertising to their best advantage to inspire a customer to purchase their product. Further, the company doesn’t care about the customer’s experience purchasing their product and what happens after that customer has purchased the product. This flawed philosophy is costing companies business and even forcing them to close up shop. Through her acronym of DOMORE, Morgan shares her perspectives on how companies can fix this by sharing research and examples of companies that are thriving in their ability to give excellent customer experiences. There is a lot of information in this book that is helpful to business leaders to improve their ability to not only reach customers but to keep them engaged with their brands leading to loyal customers. Some of the research in particular that was interesting was the generational research about purchasing behaviors and why companies need to shift their approaches to match up with the current market. I also enjoyed the practical examples of how many companies have forward thinking in mind with regards to their customers, and how they have tailored their business to reflect the values and needs of their customers. While many of the concepts discuss the overall theme, it is helpful to have these examples since the paradigm of how businesses operate is shifting and these company examples are really paving the way to do it. There is a variety of information to keep the reader interested with plenty of beginning steps to begin the process of putting the customer at the center of the business. The editing is professional and the writing is clear. There are several problems with this book. I felt let down through the whole book until I went back when I was done reading and really looked at the chapters. Then I understood what I was missing and had to go back through and make all the information connect. The book starts out with an introduction about this exciting DOMORE theory that I was looking forward to reading about. I finally hit chapter four where the acronym finally gets explained…only it wasn’t really explained. I realized later that the author titled each of her chapters after that on each letter of the acronym and was explaining it to me the entire time I was wondering what happened to it. The information was interesting and I kept hoping it would connect. It occurred to me at the end that the chapters were the explanations of the theory. I wish the author had been more detailed in her introduction of it. The chapters were clear and great after I realized what the set up was. The introduction to it should introduce the acronym, a graphic would be helpful, and set up the rest of that section of the book. The other complaint I had was with the graphics that existed. They were in black and white and so small I couldn’t read anything on them so they might be great, but I can’t read them to tell so they may as well have not been in the book. In the sections that discussed those graphics it was hard to follow the reading because I couldn’t refer to the graphic. A customer’s experience is one of the most important element when running a business and offering products or services. When operating a company of any kind, assigning a designated individual or team to handle customer relations is what will help you remain in business. This resourceful guide breaks down the negatives that companies and brands are doing that jeopardizes their connections with their customers. Reading this book provides you with an insightful view and examples to take to improve A customer’s experience is one of the most important element when running a business and offering products or services. When operating a company of any kind, assigning a designated individual or team to handle customer relations is what will help you remain in business. This resourceful guide breaks down the negatives that companies and brands are doing that jeopardizes their connections with their customers. Reading this book provides you with an insightful view and examples to take to improve the customer service aspect of your company. Without offering an exceptional experience to every individual that pays for your product or service, do you really think you’ll have a successful running business? In “More Is More,” author Blake Morgan talks about the underlying issues that arise easily overtime once there’s an expansion of any business. Medium to large corporations suffers the most because they have sectors that are off doing their own thing instead of being aligned with the entire company’s culture. This immediately causes for the confusion of the employees and customers, which makes it even more difficult to get everything back in order. Example advice includes customers wanting a quick response, “companies must operate in a 24/7 world”, go where your customers are, like social media apps. Other advice describes what some popular brands are doing and is working for them and their customers. If you’re owning a business and want to keep your customers, following along to the suggestions made in this book would be highly beneficial. A few days ago I finished reading a great book worthy of taking notes and revisiting in the near future. The fitting title of this book written by Blake Morgan is, "More Is More: How the Best Companies Go Farther and Work Harder to Create Knock-Your-Socks-Off Customer Experiences." As a strong believer in constant improvement of a companies relationship with customers and possible new customers I have read, researched, and applied many systems over the years. However The Customer Is Always Right! I wanted to love this book but felt that there was a lot of time spent on things we all know about customer service already. Of course the way we treat the customer matters, and it felt like Morgan spent a lot of time trying to convince me that that was true when the book could have been shorter and just focused on the “how”.